Charlie came to us in 1999 when he was two years old from a single mom who worked all day and had two young boys. Charlie received little care and attention, lived in a small fenced backyard and was rarely walked. He barked during the day and especially at night which is an inborn trait of this breed to guard against any kind of predators. After numerous neighbors complained and several police visits, she realized she had to give him away. It was a difficult adjustment for Charlie in the beginning who would lay in the corner of our kitchen with the small stuffed bear she had sent with him and stare up at us for hours. Charlie never seemed to get over being given away. He no doubt had a distant memory of the attention he received as a puppy. Charlie was given a new life with his newfound companions, Emma, Aspen and Maxwell (all deceased) as well as later, Annie (deceased). 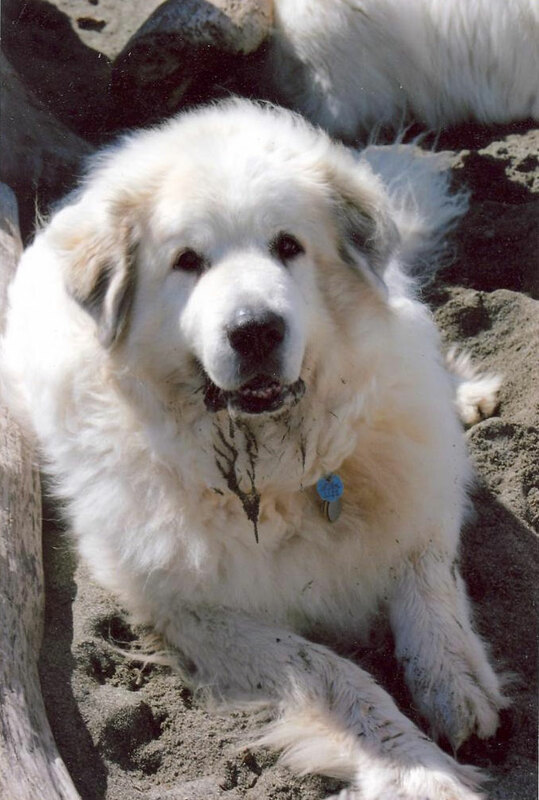 He ran on the ocean beaches near Westport, regularly visited off-leash dog parks around Edmonds, Redmond, Seattle and Whidbey Island, experienced overnight visits along a secluded river in the Wenatchee National Forest, hiked in the Olympic National Forest and lived his later years at Precious Life Animal Sanctuary surrounded by forests. Charlie was a sight to behold. 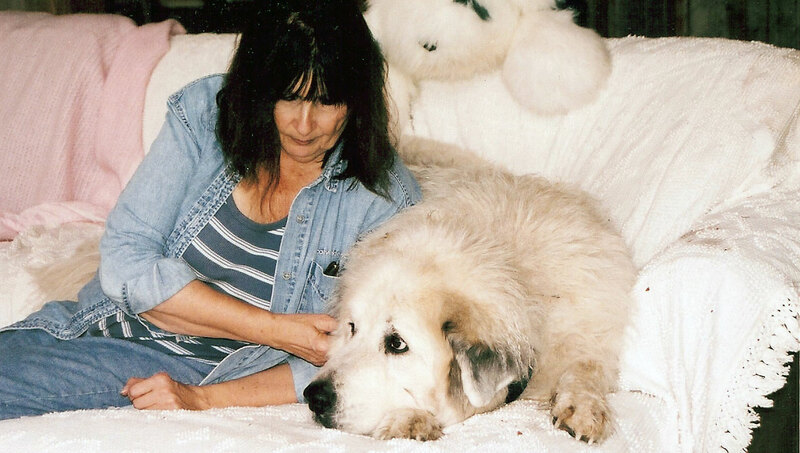 He was enormous with a massive head, body and legs much larger than our full-grown Saint Bernards. 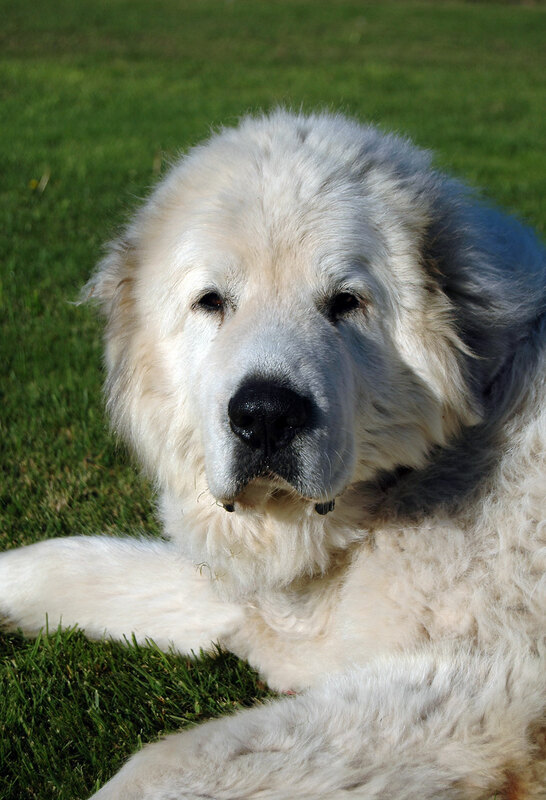 He had thick, deep, beautiful white fur accented by buff markings and the deepest perfectly round black eyes that differed from the other Pyrs who all had almond-shaped brown eyes, Charlie weighed 203 lbs. in his prime. 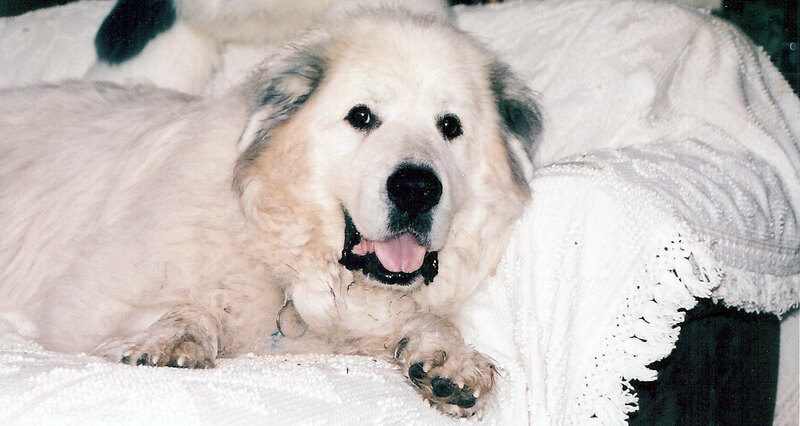 No other Pyrenees and few other dogs could come close to matching his size. To look at Charlie was to see a smaller version of an albino black bear found in the rain forests of British Columbia. He was bear-like in nature, solitary, independent, and driven to explore with an uncanny sense of smell. Charlie was the envy of many dogs at the Edmonds off leash beach who played or retrieved near him as he explored patches of algae next to the shore. Charlie would look for and find filleted-out fish carcasses thrown overboard by fishermen and drag the skeletal remains to shore. He would tear apart and eat the head and tail with his large, curved nails and be heartbroken if his prize was taken away. Charlie would play with his pack members that continued to grow in numbers but was more content to lay by himself and look out over the water or up in the sky for long periods of time, fascinated by anything that flew. No matter where Charlie was taken, once seen, people would stop in amazement and ask, “what is he?” and want to pet him. On the beach, children were drawn to him as if by an invisible bond. Charlie looked like the live Father Bear to the stuffed bears they had at home that provided so much comfort and security. Many kids would sit with Charlie for long periods of time to talk to him, kiss and hug him and lose themselves in his fur. Many grownups were drawn to him in the same way and were touched by his immense size, beauty and gentle nature. Charlie was not aggressive, never fought and, when approached by threatening dogs, could disarm them and move on. He possessed a rare trait in that he never could harm any living thing, wild or tame. He could easily flush out raccoons and opossums from brush and looked surprised when they scampered away but was never interested in chasing them. At times in the late evening walks at the Edmonds off leash beach, Charlie would slip away and head for the north rock jetty that protected the south end of the Edmonds boat marina. One evening, he got away, headed to the jetty and I went to find him. I could see him a distance away lying on the beach under a moonlit sky. Lying quietly beside him was a baby harbor seal that he had befriended. Charlie was wagging his tail so proud of his newfound wet spotted companion. As I approached, the baby seal was startled, awkwardly moved over the sand toward the water and disappeared. Charlie went to the water’s edge, paced up and down and barked hoping for his friend’s return. On another occasion, I took Charlie and the rest of the pack to Twin Lakes Park off of I-5 near Marysville. While the entire pack moved ahead along the lakeshore, Charlie stopped at a marshy area by the water’s edge. He had found a nest of newly-hatched mallards, sniffed each one of them while they emitted high-pitched squeaks and then moved on. Charlie lacked one social grace he never overcame. Whenever he could escape from his leash, he would enter the homes of total strangers if they happened to leave their front or back doors ajar. He would then sniff around for cat and dog dishes or beg for handouts. Fortunately, while his presence created immediate alarm, it quickly disappeared with his gentle demeanor. However, one incident of an unauthorized entry backfired. On a warm August morning, Charlie and the pack were on a long stretch of beach that ended at the downtown waterfront in Port Angeles. The morning sun was hot and the pack had spent considerable time in and out of the water, rolling in the sand and were covered with algae and kelp. Charlie was way ahead and did not slow down when called. He climbed the steps of a bulkhead in front of the Red Lion Inn and entered their main entrance. Upset and embarrassed, I tried to close the distance between us and minutes went by with no sign of Charlie. Suddenly, Charlie ambled out of the hotel covered with sand and seaweed with several maids shouting and waving towels and dust mops at his heels. Due to his size, Charlie suffered tears in his cruciate ligaments on both knees and underwent surgery. Afterward, he didn’t have the will for long walks and tired easily. He was content to stay in the shade during the day and sleep in the van at night with a few others always hoping for another trip somewhere. If one of the dogs ever had an accident in the van, they would simply move to a clean spot. Charlie, however, would be so upset he would attempt to cover it with blankets until his nose was raw and bleeding. During 2005, Charlie began to pant excessively which became worse with a definite shortness of breath. We took him to a surgeon who diagnosed his condition as laryngeal paralysis. He said, due to his age and size, to take him home, keep him comfortable and let him die. We took Charlie home heartbroken, tears flowing, trying to imagine the loss and a life without our gentle bear. We decided to take him for a second opinion and found a surgeon who believed he could successfully operate and increase his breathing capacity. Charlie lived through the painful surgery and recovered. He was now able to breathe easier and make his rounds, but sadly he had lost his powerful deep bark. For the next three years, Charlie enjoyed his sedentary life, rarely wanting to come inside. He was happiest outdoors even in the winter facing one snowstorm after another and laying and sleeping in blankets of new fallen snow. On the morning of September 10, 2008, Charlie laid by the van in the bright morning sun which was unusual and would not raise his head for a dog treat which was even more unusual. He always hid his pain so well that on close inspection his eyes were glassy, unfocused and he couldn’t raise his head. We rushed Charlie to the veterinary clinic and he took his last breath in our van in the parking lot. It was difficult driving home through the tears knowing what lay ahead. I built a casket and we placed Charlie in it with his blanket and toy. We took him up the hill to the sanctuary cemetery overlooking the Olympics and buried him next to his favorite long-time companion, Annie. Grief can’t be measured in time because today it is still difficult to look at his pictures and know our gentle, sensitive bear is gone.